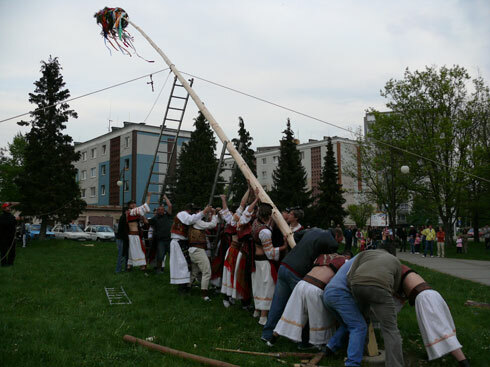 VodaFest in association with Melbourne Czech and Slovak schools invites you to a full day event with free admission – traditional May Pole Building, which will take place on Saturday, 4 May 2013 at Sumava Peksa Park, 46 Locks Way, Belgrave South. • 12.15pm-12.30pm – Marionette Show - Red Riding Hood. • 12.30pm-1pm - Workshop led by Ivanka Jančárová - etymologist about traditional Czech and Slovak costumes and their importance in culture. 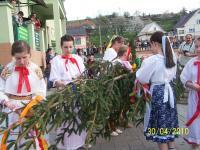 We will also explain the tradition of a May Pole building and other May traditions. • 1pm-1.45pm Vlasta Šustek will lead a workshop for adults – Methodology of Czech reading. Admission to the workshop is a gold coin donation which will be donated to Sumava Peksa Park. • 2pm - Rested and strengthen by good lunch we will begin preparations for the construction of our first May Pole. 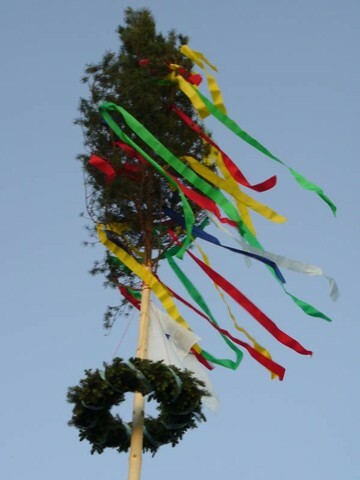 According to the tradition May Pole needs to be decorated by ribbons. This is a job for women including singing and dancing. Children will join with the May dances and songs they have learned in morning school. Once May Pole is decorated the men’s job is to erect it. All strong men are welcome to help. • As May is a time of fun and celebration afternoon will be dedicated to the School of Dance led by Danka Lalíková. So get ready your dancing shoes and learn some traditional steps. • 4pm – Celebration will continue with Vintage Blue Music – Czech music band. Overnight stay is allowed so don’t forget your tent. Important! to be able to erect the May Pole we need strong men. Guys, boys, husbands, dads come and join! Finally, thanks Franta Vanya, who came up with this beautiful idea of May Pole Building. We look forward meeting you all at Sumava. Submitted by peter (not verified) on Sun, 01/05/2016 - 5:20pm. Submitted by ALI BHAI (not verified) on Mon, 01/02/2016 - 10:32pm. Submitted by ALI BHAI (not verified) on Wed, 13/01/2016 - 7:54pm. Submitted by 70-410 (not verified) on Tue, 22/12/2015 - 8:28pm. I think so its look like an school event and i am sure child enjoy this event. And your Images is look like an interesting and amazing i am also sure the people like your post and like your topic. By the way i am study about the different certified paper like http://theexamcollection.com/70-410/ this paper provide an information about the windows installation and configure the server. And thanks admin for shared amazing topic. Submitted by EN (not verified) on Sat, 12/12/2015 - 6:20pm. Submitted by EN (not verified) on Thu, 10/12/2015 - 6:05pm. Submitted by free facebook likes (not verified) on Sun, 29/11/2015 - 5:00pm. Submitted by free facebook likes (not verified) on Sun, 29/11/2015 - 5:02pm. Submitted by ranui (not verified) on Tue, 07/04/2015 - 3:41am. Submitted by Anonymous (not verified) on Fri, 16/01/2015 - 4:00pm. Submitted by Anonymous (not verified) on Fri, 16/01/2015 - 3:57pm. Submitted by Anonymous (not verified) on Fri, 16/01/2015 - 3:55pm. Submitted by sgsg (not verified) on Fri, 16/05/2014 - 6:38pm. The festival is often a special event of lavish feasts, normally having a non religious focus. Apart from religion, in addition to from time to time folklore, yet another major foundation will be agricultural. Food is really crucial that numerous festivals are usually connected with crop time. Submitted by Amytik10 (not verified) on Fri, 21/03/2014 - 9:17pm. I was really excited about the Maypole Celebration. First of all I would like to appreciate the effort taken by the organizers to do something like this. I think the children and everyone who participated had a great time together. Thanks for the details. Submitted by Anonymous1 (not verified) on Thu, 27/02/2014 - 12:54pm. Submitted by Anonymous1 (not verified) on Thu, 27/02/2014 - 12:52pm.